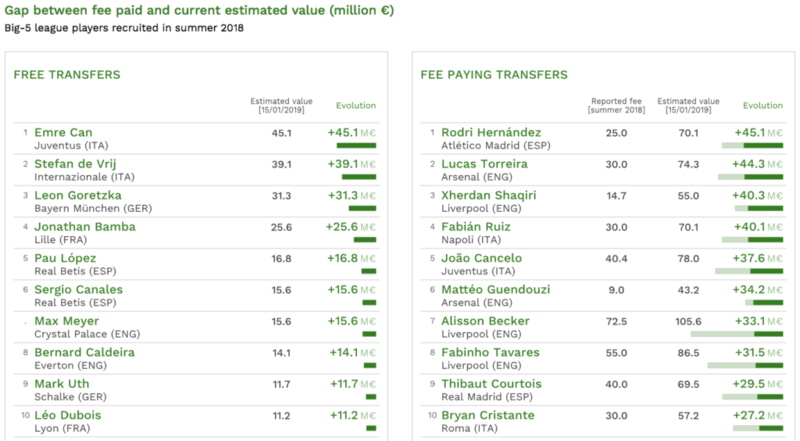 January 22 – In an analysis of players whose current estimated transfer value exceeds their fee paid, Liverpool and Juventus come out as leaders when it comes to deal making on top talent with both clubs having three players in the top 20 list of players. The data, from the CIES Football Observatory, comes from the estimated values of the CIES’s own proprietory algorithm. The research looks at transfers in the summer window – the winter transfer window is still open. Emre Can, Cristiano Ronaldo and Jopao Cancelo appear in the Top 20 the list for Juve, while Xherdan Shaqiri, Alisson Becker and Fabinho Tavares appear for Liverpool. “The excellent performances of both these players and their employer teams explain in large part the magnitude of the gap observed,” say the report authors.